First we came out with the Gun Metal Gray clasps to replace the black epoxy coated clasps, and now we have a new high strength material for 6 MM clasp called N40 Neodyminium. That is why we feel we are the leader in magnetic clasps for magnetic jewelry. Below are the clasps we generally have in stock. They are made of Neodyminium and are the highest strength (3000 gauss) magnets available anywhere. These magnetic clasps are generally used with magnetic hematite beads, or magnetite, beads that average 800 gauss. While being the strongest magnetic material available, Neodyminium is very corrosive and must be protected with a coating such as nickel or epoxy to prevent corrosion. Unlike the black magnetite beads, the epoxy or nickel coating will wear off with time and the clasps will need to be replaced. Clasps are are sold in groups of 5 pairs and can be purchased online. Most orders are shipped the same day ordered if the order is received before the post office closes. All orders are shipped First Class Mail or Priority Mail depending upon the weight. The Magnetic Hematite Shoppe is always developing new and better products. Until now all clasps were made of N35 Grade Neodyminium material. This new clasp is made of N40 Grade material and is about 20% stronger than the standard N35 clasps. Designed exclusively for the 6 MM Clasp and plated with Gun Metal Grey Nickel, these are the best 6 MM clasps on the market. We are a leader in clasp development. First we brought you the Gun Metal Gray claps that replaced the black epoxy and now we bring you the highest strength 6 MM clasp on the market. The new price is $0.65 a pair. Works best with 80 lb monofilament line but can be used with wire or other stringing cords. 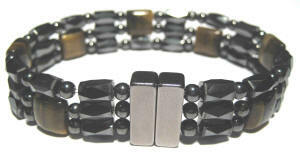 The Magnetic Hematite Shoppe is always finding new and better products. The new 7 MM Gun Metal Gray clasp is designed as the next step up above the 6 MM Clasp and very strong. We are a leader in clasp development. First we brought you the Gun Metal Gray claps that replaced the black epoxy. Now we bring you the 7 MM clasp The price is $0.89 a pair. Gun Metal Gray coated clasps, 8x8 MM, sold as a pair of plus and minus pieces for $1.16 a pair. Shipping is $7.00 for 3 day First Class Mail, for all quantities below. If you are ordering different types of supplies and the final total price shows more than $14 for shipping, you will receive a refund when we process the order. The refund will be sent at a later time when we process the order, which usually the same day. Gun Metal Gray coated double clasps, 6x6x12 MM, sold as a pair of plus and minus pieces for $1.83 a pair once we receive our next shipment. Works best with 80 lb monofilament line but can be used with wire or other stringing cords. Gun Metal Gray coated triple clasps, 6x6x18 MM, sold as a pair of plus and minus pieces for $1.99 a pair. Works best with 80 lb monofilament line but can be used with wire or other stringing cords. When working with these clasps, you must work on a metal surface or they will come together with such force they may break in half. Shipping is $7.00 for 3 day First Class Mail/Priority Mail, for all quantities below. If you are ordering different types of supplies and the final total price shows more than $14 for shipping, you will receive a refund when we process the order. The refund will be sent at a later time when we process the order, which usually the same day. Chrome Nickel Plated 4 x 12 MM Magnetic Bars sold individually Each bar is a clasp by its self and no string is required to assemble these bracelets Sold individually for 29 cents each and sold as a 55 piece bracelet (8.5 inches) for wholesale price of $15.95 We sell them Retail online for $31.00 but many of our customers sell them for $.75 a bead or about $40 a bracelet at fairs and festivals. Shipping is $7.00 for 3 day First Class Mail, for all quantities below. If you are ordering different types of supplies and the final total price shows more than $14 for shipping, you will receive a refund when we process the order. The refund will be sent at a later time when we process the order, which is usually the same day. Chrome Nickel Plated 5 x 12 MM Magnetic Bars sold individually Each bar is a clasp by its self and no string is required to assemble these bracelets Sold individually for 39 cents each and sold as a 43 piece bracelet (8.5 inches) for wholesale price of $16.77 We sell them Retail online for $31.00 but many of our customers sell them for $1.00 a bead or about $43 a bracelet at fairs and festivals. Include the cost of the clasps and $7.00 shipping & Handling. Magnetic Jewelry is a division of OPB Enterprises.